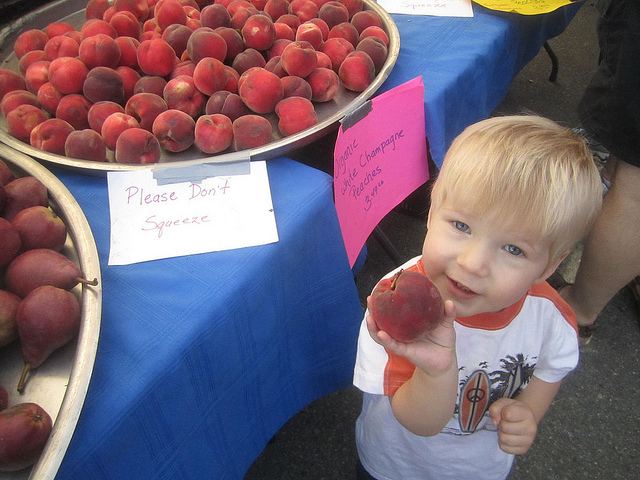 The Climate Crusader gets her weekly dose of community at the local farmers' market. By now, many of us know the arguments for reducing our food miles and eating more local food. It reduces your carbon footprint, by reducing the distance your food is shipped. Eating local often means eating healthier, as you're buying more whole, unprocessed foods and fewer pre-packaged products. This further reduces your environmental impact, by reducing the amount of packaging you consume. You're also supporting your local economy and promoting local food security. For me, however, the biggest benefit to eating local is more intangible than all of that. I like eating local because of the sense of connection and community I find at my local farmers' market. I've been visiting it for more than 10 years now, since before I had children. In that time I've seen vendors come and go, and watched the market grow. I regularly bump into friends and acquaintances at the market. I've also gotten to know the people who are there every week. When I think of the farmers' market, it's the people I think of. People like the woman from Never Say Die Nursery, who's quick to tell everyone how good her produce is, and who always sneaks an extra tomato, carrot or pepper into my bag. People like Barrie Redl, an honest-to-goodness cowboy who brings his grass-fed beef to the market every week, and who loves to joke with my children. People like the Forstbauers, who give my children little gifts of funny-shaped carrots and small ornamental gourds. 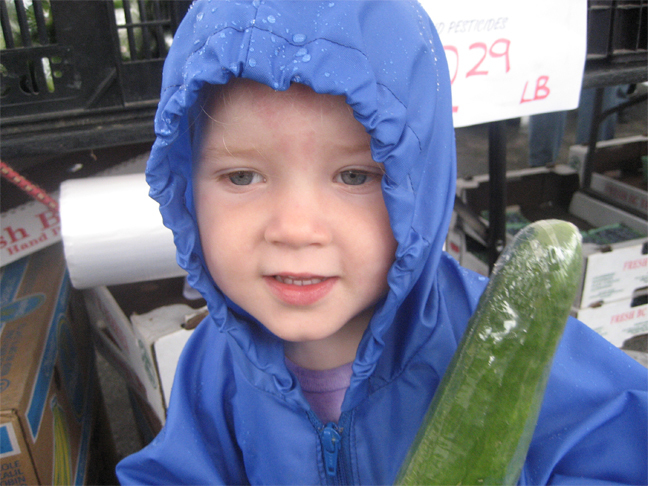 Visiting the farmers' market is a weekly event for my family. The produce we find marks the changing of the seasons, from rhubarb and early greens to blueberries and corn to apples and winter squash. We see different people in different seasons. My children have formed connections with many folks at the market, as well. For example, they always run to hug the lady who sells us our apples at the winter market, and they posed for a photo with her at the final winter market in April. I believe that fresh, local food is healthier, because it hasn't lost as many vitamins and minerals by being shipped and stored. However, it also feels more nourishing, because when I'm eating the food I've bought at the market I'm thinking of the people who grow and sell it. Every fruit, vegetable, egg and piece of cheese has a story - and I know what that story is. It's food that builds and sustains community, which is a very powerful thing. In the end, this is what really keeps me coming back, week after week. Are you also a farmers' market regular, or someone who frequents farm stands or buys shares in a CSA? I'd love to hear about how you experience community when you're shopping for local food. I started out as a farmers' market girl but a busy schedule led me to CSA. I loved being part of a CSA - quick and easy local, healthy food. After three years doing the CSA thing, though, I'm back to the farmers' market. You just cannot beat the community - and the choice. I could have sworn I left a comment. It better not have ended up in spam! I feel the same way -- having my kids meet the farmers, observe how the offerings change with the seasons, relish the samples of stone fruit, apples, oranges and berries -- you can't beat that.